To make thing with their hands, because it does not require any special skills and sophisticated equipment. The main thing is desire! For example, to make a backpack is very easy. Dense fabric, materials for decoration, furniture, sewing supplies. First we need to gather all the necessary materials. Fabric choose at your own discretion, but it is desirable that it was thick enough, because it affects the shape of the backpack. You can use old jeans. Also, we need a bias binding 2 m Velcro 5cm, lace length 30 cm eyelets 4-piece, small piece of fabric. When all the necessary elements in place, you can begin to work. You should first find details. We need 2 rectangular piece of 30x25 cm, oval piece for the bottom cover 20x12 cm, a square of 15x15 cm for the pocket, the valve 20x10 cm with two straps 54х4 cm and a piece for the handle 20х3 see the mandatory parts with regard to the seam. The details of the stitch in the following order. You need to handle the edge of the pocket binding, and then sew it on the front side of one of the rectangles. Now sew the side seams of the basic details and processed the upper section of a leg. The edges of the valve must also be finished with bias binding. To make the straps need to be put into the width of the part of the straps wrong side up, sew, then turn and iron. Is also the handle. The bottom will need to glue the interlining. The next step we cut to the upper rear of the main details protecive handle, straps, and then the valve. To the bottom slice back detail protecive webbing, and then sew the bottom. Here and ready the body of the backpack. There were small details. Next, you need to punch through 2 grommets on either side. The middle of the lace to attach to the middle of the upper edge of the main part under the flap and sew. It remains to sew the Velcro strip on the underside of the valve and the front side of the backpack. Ready! 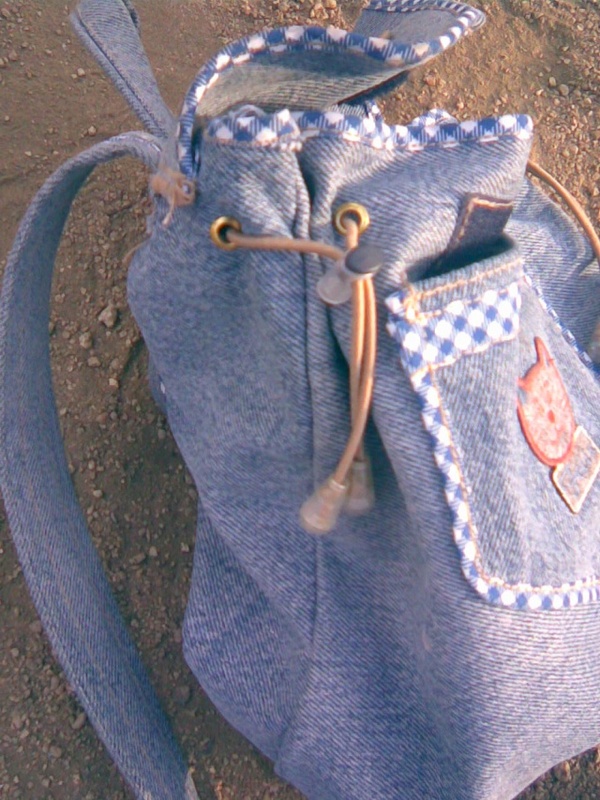 So, very easy 2 hours you can make a cute little backpack, giving a second life to old jeans. 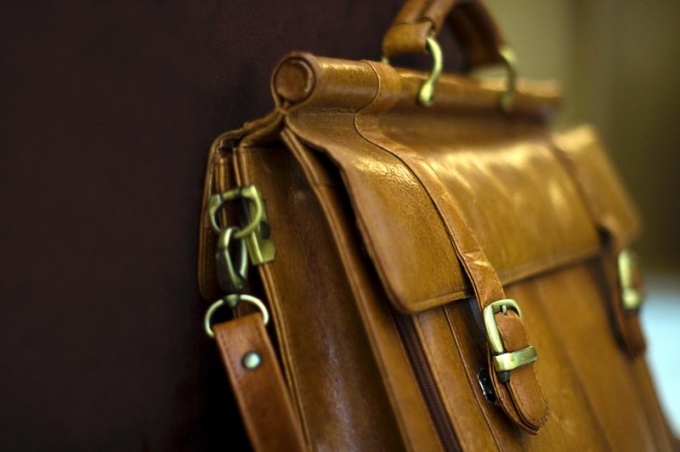 Portfolio - the perfect complement to a business suit. It will put a folder with documents, magazines and more. Sew elegant women's briefcase is quite in your power. The work will not take much time. For this you can use any dense material, but it is best to sew a portfolio of natural or artificial leather. paper or cardboard of A4 size. The main parts of the portfolio are rectangular in shape, so to cut them directly on the skin. The main purpose of the portfolio is to preserve the integrity and security of business papers, so the size should be no less than A4 sheet. The best option is to cut 2 unnecessary folders for papers. From one take the front and rear walls, they are the same size. The second cut from the front wall and smooth coal, adjacent to one of the long sides. This will be the pattern of the valve. But we can all draw on graph paper. Put a piece of leather wrong side up. Apply to his parts below the long sides of patterns parallel to each other, and the distance between them was 6-10 cm of the Short edges of all three pieces are a continuation of each other. Outline the pattern. Better to draw with a ballpoint pen, and cut - cobbler's knife with a metal ruler. On leather, the workpiece will have plenty of details lining and insulation. The batting needs to ensure that the portfolio had at least a little stiffness. It can be successfully replaced, for example, thin purplenum. The lining can be made from silk, flannel or kalandrirovannogo Capronum. Baste the insulation is lined and quilted. You can also use ready-quilted fabric on sintepon, she sometimes comes across in the shops. Fold leather detail and lining wrong side to each other and pristrochite on the edges. Treat the lateral edge. This can be used, for example, strips of suede or leather in a contrasting color or matching. Fits tight and elastic. The strips fold in half and pristrochite to the side sections of the workpiece. Make strip for the clasp. Draw and cut out from the skin strip with a length of 60-70 cm, its width is 10-12 cm In any case the strip should be slightly longer than the workpiece, since it covers the entire portfolio and a little stands for valve Fold the strip in half and glue or sostrochite. You can make striped two piece. The short edges of the workpiece, divide in half, mark the middle line and sew to it a strip of the clasp. Leave a free piece of 5-6 at the front of the bag - there will be a hole or a loop for the buckle. To protruding from the valve end of the strip sew the buckle. Loop for her pristrochite to the edge strips on the front of the bag. The buckle can be any. If the pin in the second end of the strip the holes. Buckle with metal parts reinforce grommets for plastic that is not necessary. Will have plenty of sidewall. They are rectangles, the length of which is equal to the height of the lateral, width - the distance you had between the parts of the pattern. Side parts can also be strengthened by lining with synthetic padding, provided that your machine take the fabric that thick. Sew the sides to the places reserved for them. Panel braid or strips of suede the remaining stitches. Attach a handle. This can be, for example, a belt matching the color of old bags. But the handle you can make, cut out a strip of leather of appropriate length and folded it in half. Methods of attachment can also be different. Can remano just sew to the sides of the cover. But you can do it and on the little carbines. Then sewn to the cover of metal or leather loops that, like buckle, reinforced eyelets. Handles and weave, for example, from leather cords. The backpack has long ceased to be accessory solely athletes. He became part of the urban fashion. Backpacks are pupils and students, office workers, visitors of night clubs and even fans of balls. Sewing handy bags of kiln used a variety of fabrics, but the manufacturing method is approximately the same for different species. Transfer the pattern to paper. If necessary, increase it. Design backpacks are different. Popular pattern sports backpack, consisting of a square bottom, four rectangles – side, square with rounded corners top of the valve. The backpack usually has additional pockets, they can be from one to five, or even eight. The top of the pocket flap on the zipper or button. 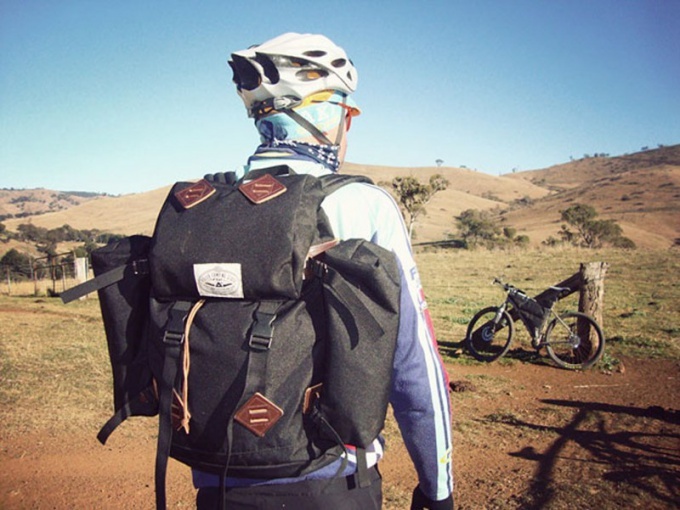 The pattern can be easier, to consist of one long strip equal to twice the height of the backpack and the width of the bottom, two rectangles of the sidewalls and the top of the valve. Circle the parts on the base fabric. For avizent, the calendered nylon and parachute silk it is best to draw an ordinary ballpoint pen. All sections add allowances of at least 1.5 cm margins should be at least 5 cm. Such a large increase is needed because the stitching will have linen or denim seam. Take of the backpack. It's best to do a soldering iron or a device for a burning out on a metal ruler. Scissors in this case is not suitable, fabric will very much lohmataya. Straps and belt will have plenty of parachute sling, fortunately now you can buy them in a regular store of goods for needlework. The fit and grosgrain ribbon with a width of 5-7 cm, If necessary, can be made of the same materials belt and cross strap that will be sewn at chest level. Mark locations for pockets. All overhead items it is better to sew before you start to collect the backpack. For workpieces pockets better to make a pattern from cardboard. Detail should be slightly more reserved, because pockets need a roomy. Overlap the fabric on the template, bend the allowances on the wrong side of them very carefully and zautyuzhte. The pockets do not have to sew a double seam. For each valve will take 2 parts. You can strengthen them with adhesive interlining. Billet fold right sides together and stitch, leaving an unsealed edge that will be sewn to the backpack. The allowances of the open edges align, trim, finish with a serger and zautyuzhte on the wrong side. Baste the pocket and flap to the right of the backpack. If the valve will be closed with a zipper, the order is slightly different: first zautyuzhte allowances and the valve pocket, then vsheyte the zipper, and then baste and pristrochite both items to the backpack. To the part of the backpack that will fit the back, baste and pristrochite straps. It is better to sew them diagonally, crosswise, securing the corners and the intersection of leather or calender plates. As all the details of the backpack, sew webbing nylon thread. Baste the cut valve to the upper cut parts with straps. If the valve will be fastened to a zipper, it also needs to sew before to collect the backpack. But you can do the clasp and on the metal buttons, and buckles. Some backpacks flap opens and a zipper, and buckles. In the latter case, parachute straps cover the whole backpack is sewn to the flap under the strap to the bottom and about half of the part that is the Central pocket. Slings should be placed symmetrically. The free ends have a length of 30-50 cm. After all of the invoices items will be sewn, you can begin to assemble the backpack. The procedure can be anything, but need a double seam. For example, you can use the following. Align the cut parts so that one seam allowance was 1 cm longer than the other. Sostrochite seam. Fold the free long edge of the seam allowance and make a second line at a distance of 0.2 cm from the fold. Other options are possible seams. Fold the top edge of the backpack and hem. Put the grommets. To the lower edge of the binder can sew an additional camera. It is a tube of nylon or silk. Its height can be any. The upper edge of the hem. Insert the two cord in kulisku camera and through the grommets. You just have to sew the strands to the straps. 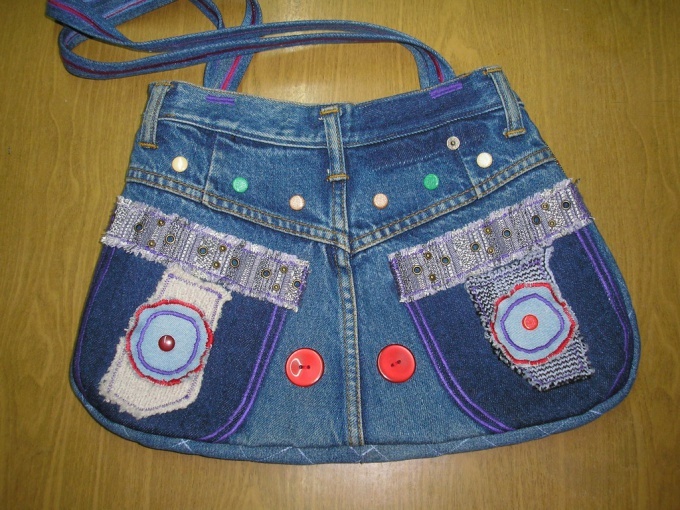 Old jeans can easily be transformed into beautiful and stylish backpack. It is suitable to clothes of sports style, romantic light dresses, fashion this season's coats oversized. And stitch this original accessory will even the young fashionista, sophisticated patterns and special stitches are not required. 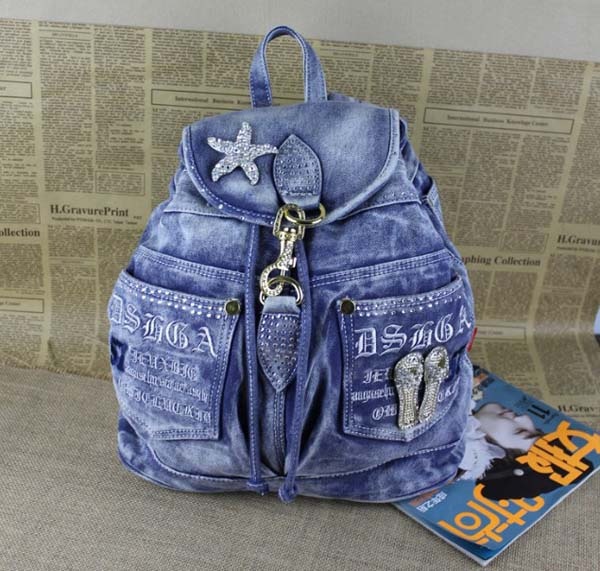 You will need old jeans (preferably with a wide leg, the width of the backpack is equal to the width of the leg opening), skinny leather strap and thread to match. To make the backpack with your hands, pattern is not needed. Cut the pant leg from jeans, turn it inside out and sew at the top. Turn back. Fold in half to make a backpack. The bottom of boucheny have to close a makeshift inner compartment is approximately ⅔ (see picture). Take stropki from the strap and sew in two places - on the front of the backpack top and bottom. Insert the strap. It remains to sew the strap. They can be made of the second leg opening, cut narrow strips and staple together. Original stylish straps will work if you do not treat them the edge, leaving ragged. You can make a bag with a shoulder strap over the shoulder, they never go out of fashion for a very long time. As the straps can be adjusted long leather belt, thick twine, braided leather laces pigtail. Helpful hint: decorate a backpack from jeans to your liking. Leather straps, metal brutal accessories, bright buttons, decals will make a attractive and trendy accessory. 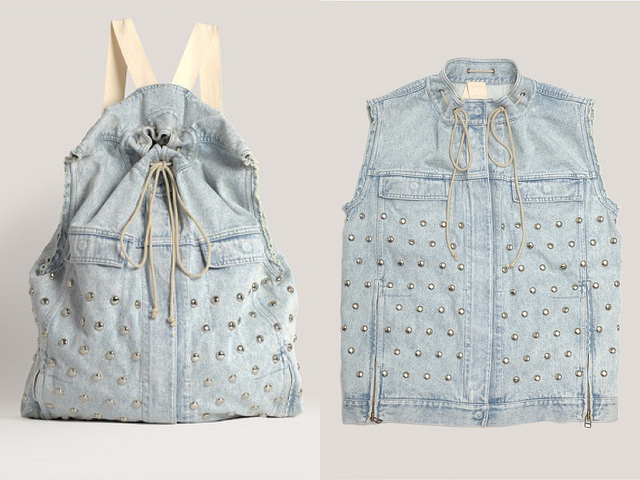 The backpack can be made not only denim pants, but also from old denim jackets, shirts, shorts. 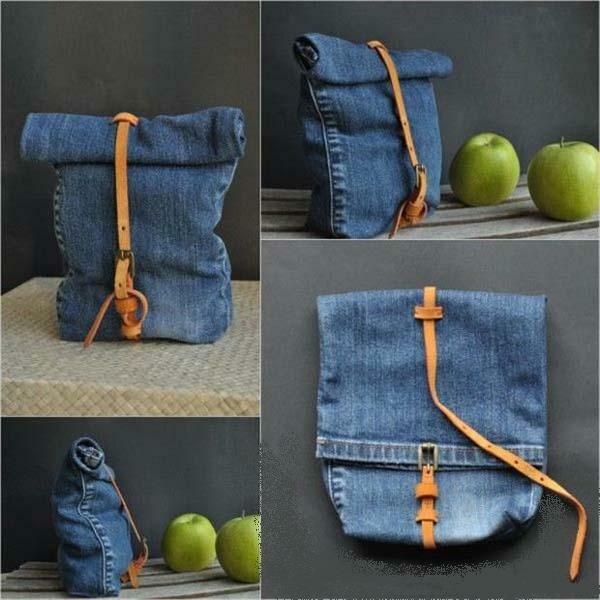 Almost any old thing can be turned into a new trendy and convenient bag. Please note: the seams on the backpack of jeans can make a noticeable contrast. To make it look organic, make them smooth, is wide enough.